2000AD comic Progs 953, 954 and 955 (1995) | 'TAIN'T THE MEAT… IT'S THE HUMANITY! I’d originally planned for this series on 2000AD covers to showcase the comic’s non-Dredd covers but when I remembered these gems from August 1995 I couldn’t resist. 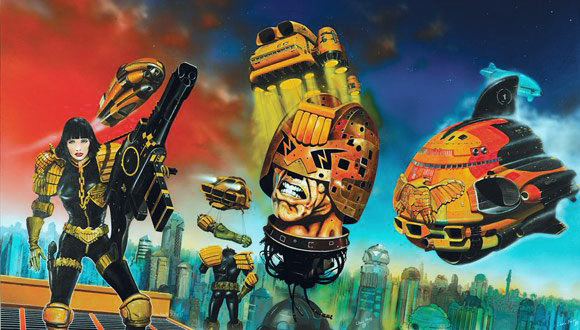 Anyone familiar with this site will know that I’m a huge fan of both artist Chris Foss and 2000AD comic, so it’ll come as little surprise that the three poster covers the artist contributed to the long-running British anthology comic would count as some of my favourites. 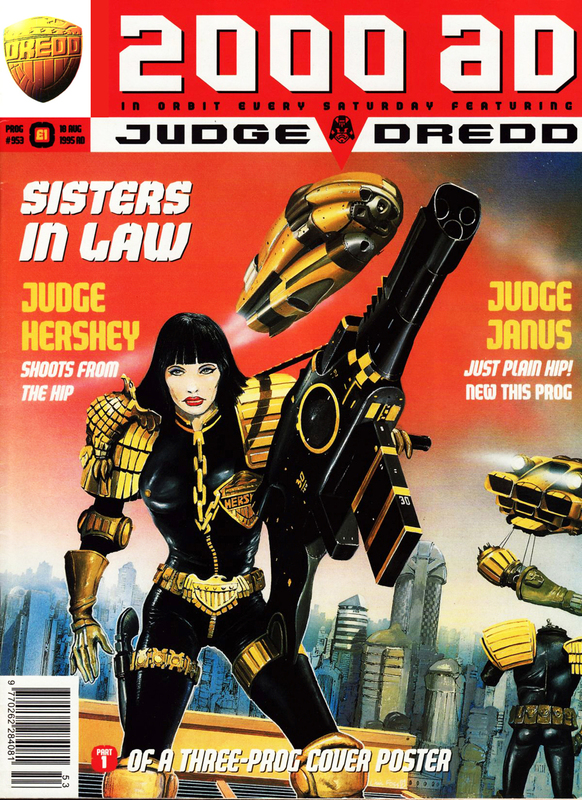 Published to coincide with the release of the first Judge Dredd film in 1995, the covers to Progs (issues) 953, 954 and 955 feature a triptych of images painted by Foss that formed a three-part poster gift for readers. 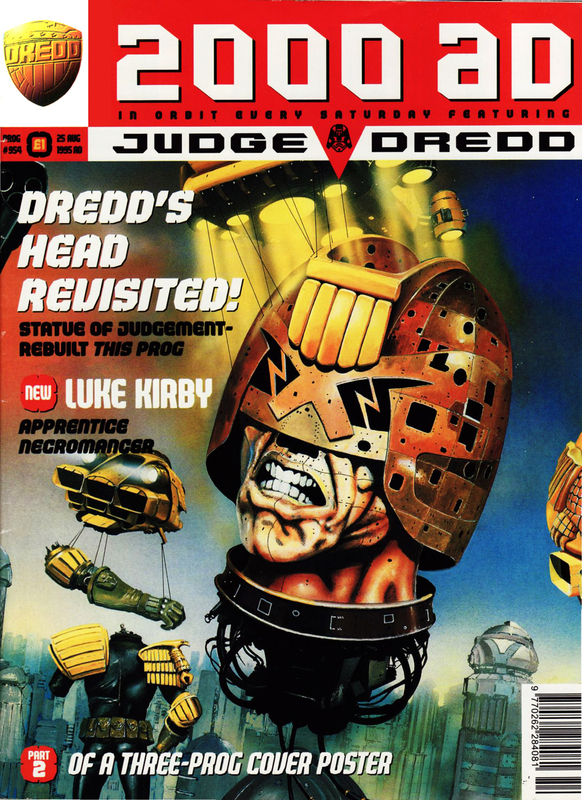 Unlike 2000AD‘s traditional wraparound poster covers (such as the one from Prog 171) the artwork was reprinted on the back covers (sans the headings) allowing the reader to detach them and glue them together. Unfortunately the three images didn’t quite fit together properly, as you can see from the composite below. The idea of a three-part cover was clearly inspired by the triptych Foss painted to the Panther editions of Isaac Asimov’s Foundation trilogy from the late Seventies, and the artists distinctive painting style works almost as well here as it did back then. Foss’ love of hardware (Hersey’s gun and Justice One for example) are clearly evident and all three covers have a great deal of impact. 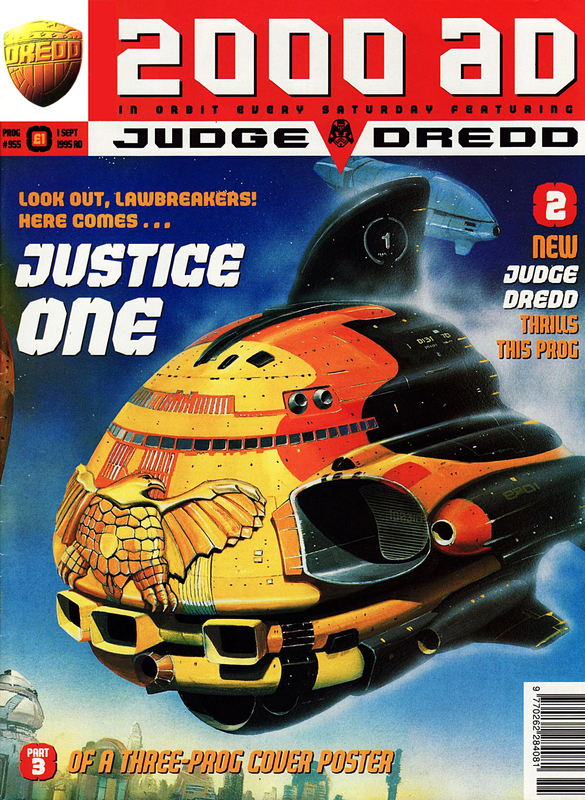 Not only did Foss paint the covers to these three issues he also drew the John Wagner-penned story ‘Jigsaw’ from Prog 953, his one and only contribution to a Dredd story and one of the few times the artist worked on a comic strip. Sadly Progs 953, 954 and 955 marked the only time the Guernsey artist worked for 2000AD. Still, he made his presence known and his paintings were truly memorable.